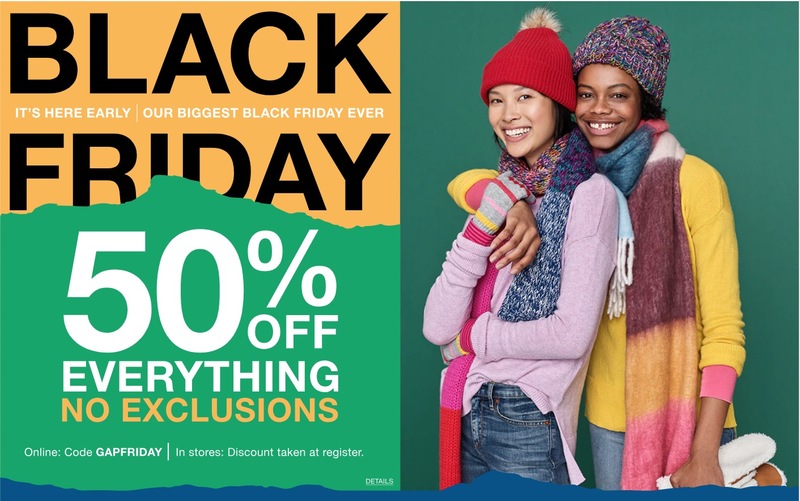 Gap Canada Black Friday 2018 Early Sale: Save 50% off Everything with Promo Code + More Deals! Black Friday 2018 sale starts early at Gap Canada and you can save 50% off everything sitewide with no exclusions! This Gap Black Friday 2018 sale ia valid from today, Tuesday, November 20, 2018 until Thursday, November 22, 2018, at 11:59 pm PT. Save 50% off Everything with promo code GAPFRIDAY at checkout. Gap Canada has FREE shipping on orders of $50 or more. Click here to view Gap Canada online offers.